Calafat, A., K. Bohrn, M. Juan, A. Kokkevi, N. Maalsté, F. Mendes, A. Palmer, K. Sherlock, J. Simon, P. Stocco, M. Sureda, P. Tossmann, G. van de Wijngaart, P. Zavatti (1999). Nightlife in Europe and recreative drug use. 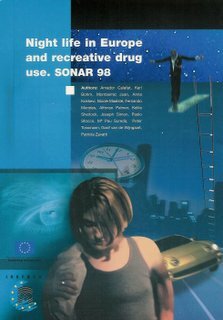 SONAR 98. Palma de Mallorca: IREFREA.